Rodents can sometimes be present in your home or business without you even knowing they are there. Unexplained marks that are smudged or crumbs, bits and pieces of things that don't make sense could be indications that you may have uninvited visitors lodging in your dwelling. Rodents can slither their way through small cracks under your outside siding panels and travel on pipes inside your homes. Rodents or mice have the ability to carry and transmit salmonella, meningitis, tapeworms and other parasites that can cause diseases to be spread. They can also climb straight up a wall and fit through a hole the size of a dime. NORWAY RAT: Also known as the "Sewer Rat", this destructive pest will cause damage to buildings and home structures by their burrowing and gnawing techniques. The Norway Rat transmits diseases to humans and their pets. This rat can grow up to 18 inches long with a tail as long as 8 1/2 inches. You won't miss it ! HOUSE MOUSE: An adult house mouse can grow to seven inches long with a 4 inch long tail and are usually a light brown to gray color. 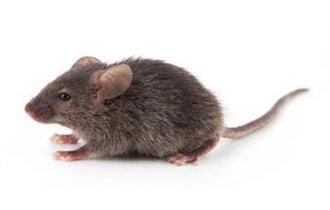 House Mice can transmit diseases such as salmonellosis and contaminate food sources for live stock and people. Mostly active during the night hours. 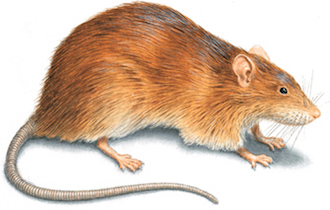 ROOF RAT: Known as great climbers the Roof Rat nests and lives above ground in trees or bushes and is very agile. They have also been known to enter your home through the pipes right up to your toilets. 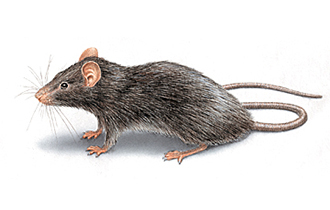 The Roof Rat can chew and gnaw through electric wires and some wooden structures. They also can chew up your home insulation for their nests and can be carriers of diseases. 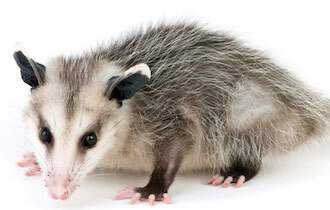 OPOSSUMS: Usually can grow to be the size of a house cat with grey to black fur with a pink nose, is solitary and also nocturnal. A slow moving animal that will hiss and growl if feeling threatened. Life span of 2-4 years only. 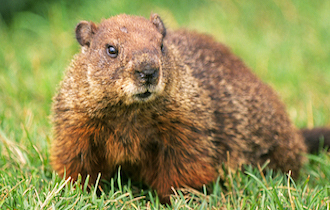 GROUNDHOGS: Groundhogs are also known as woodchucks or whistle pigs. They are the largest rodent in the squirrel family and live near corn fields, vegetable farms and along side fences. Groundhogs hibernate and come back out in March.